The best room in your house is just outside your door! has been designing and crafting award winning decks and gazebos for over 40 years. We only do one job at a time, so rest assured, your job is our most important. We can design decks and gazebos to compliment any existing architecture. When getting bids for your job, here are some questions to ask and things to look out for. We strive for perfection – down to the last detail. The result? Happy clients! Here is information on composite material suppliers and other useful links. Here's Why Sun Coast Deck is the Best in the Business. © 2009 Sun Coast Deck. Composite Deck in Hermosa Beach, CA. | Arbor and Spa in West Hollywood, CA. 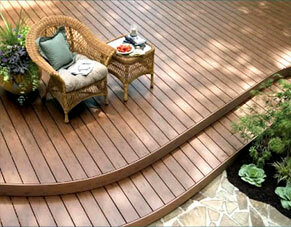 | Trex Deck and Benches in Torrance CA. | Patio Cover and Sky Lights in Beverly Hills CA. | Custom Privacy Screen in Redondo Beach | Patio Cover in Torrance CA. | Trex Deck and Barbeque in Manhattan Beach CA. | Azek Composite Deck in Hollywood CA. | Custom Curved Deck in Manhattan Beach CA.